The Antarctic ozone hole reached its annual peak size on Sept. 11, 2014 according to scientists from NASA and the National Oceanic and Atmospheric Administration (NOAA). The size of this year’s hole was 24.1 million square kilometers (9.3 million square miles) — an area roughly the size of North America. 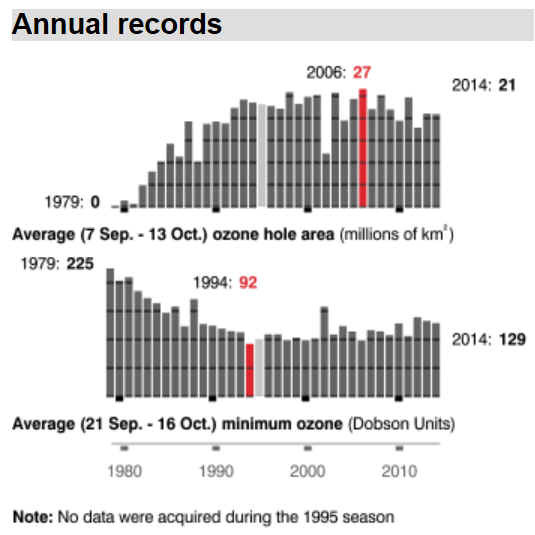 Antarctic ozone today: The 2014 ozone hole is nearly over. It still covered around 6 million square kilometres in late November, which was average over the last decade. The ozone distribution is transitting from that of spring with ozone amounts highest around the Southern Ocean and amounts lowest over the continent to that of summer with more uniform ozone amounts across the continent. Highest ozone values, above 350 DU, are over the Southern Ocean in a broad swathe south of New Zealand, with lowest values, around 225 DU, in a small residual area over the Weddell Sea. There are significant differences between the various satellite measurements. Stratospheric temperatures are rising, with all parts of the ozone layer now well above the threshold for Polar Stratospheric Cloud (PSC) formation. Through most of the ozone layer temperatures are now near the long term average, though they are colder than the normal in the residual core of the polar vortex. The polar vortex was a little above average in size at its peak in mid August but is now shrinking and is near the mean for the time of year over the last decade. Forecasts of ozone distribution suggest that the 2014 ozone hole is nearly over, however the transition to summer circulation will not happen before mid December. The 2014 Ozone Hole: The ozone hole began to form in early August and grew rapidly from mid month, covering some 23 million square kilometres at its peak in mid September. During August and September it was generally similar in size to the ozone hole of 2013, and mostly smaller than the decadal mean. During October and November it has been around the decadal mean and larger than the holes of 2012 or 2013. By late November the size had declined to around 6 million square kilometres, remaining close to the average for the decade. Temperatures in the ozone layer became cold enough for PSCs to form by May and were generally a little below the long term mean for most of the winter. They became too warm for PSCs to exist by early November. The polar vortex has generally been close to the decadal mean in size, beginning to form in early May, reaching a maximum of around 32 million square kilometres in mid August, and looking to last into December. The edge of the ozone hole covered the southern tip of South America from September 13 to 18, the southern tip of South America, the Falkland Islands and South Georgia from October 7 to 15 and South Georgia on August 25 to 27, September 28, 29, October 3, 4, 24. It is likely to do so again around November 1 to 2. The centre of the ozone hole is often offset from the pole towards the Atlantic. Stations near the edge of the ozone hole (often those nearest Australia or in the northern Antarctic Peninsula) move from within the ozone hole to outside it as the polar vortex rotates. Antarctic ozone today: The ozone hole has passed its deepest and largest and is slowly beginning to fill, but still covers around 14 million square kilometres (the size of the continent). The ozone distribution is that of spring with ozone amounts highest around the Southern Ocean and amounts lowest over the continent. Highest ozone values, around 430 DU, are over the Southern Ocean in a broad swathe south of New Zealand, with lowest values, around 150 DU, over Dronning Maud Land to MacRobertson Land. There are significant differences between the various satellite measurements. Stratospheric temperatures are past their coldest, and a warming is taking place. All parts of the ozone layer are now above the threshold for Polar Stratospheric Cloud formation, though such clouds can still persist. Through most of the ozone layer temperatures are now near to above the long term average. The polar vortex was a little above average in size at its peak in mid August but is now shrinking and is a little smaller than the mean for the time of year over the last decade. The 2014 Ozone Hole: The ozone hole began to form in early August and grew rapidly from mid month, covering some 23 million square kilometres at its peak in mid September. By late October the size had declined to around 14 million square kilometres. During August and September it was generally similar in size to the ozone hole of 2013, and mostly smaller than the decadal mean. During October it has been around the decadal mean and larger than the holes of 2012 or 2013. Daily values at Rothera dropped below the ozone hole threshold of 220 DU for the first time on July 17 and did so again on August 6 and 7. The station was within the ozone hole from August 18 to 26, and from September 6 to October 14. Ozone values at Vernadsky first dropped below the threshold on August 14 and it was within the ozone hole from August 18 to 26 and from September 8 to October 12. These edge region stations move from within the ozone hole to outside it as the polar vortex rotates. Halley has been within the ozone hole since measurements began at the end of August but ozone values are beginning to increase. The edge of the ozone hole covered the southern tip of South America from September 13 to 18, the southern tip of South America, the Falkland Islands and South Georgia from October 7 to 15 and South Georgia on August 25 to 27, September 28, 29, October 3, 4, 24. It is likely to do so again around November 1 to 2. Antarctic ozone today: The ozone hole has passed its deepest and largest and is slowly beginning to fill, but still covers around 14 million square kilometres (the size of the continent). The ozone distribution is that of spring with ozone amounts highest around the Southern Ocean and amounts lowest over the continent. Highest ozone values, around 420 DU, are over the Southern Ocean in a broad swathe south of New Zealand, with lowest values, around 150 DU, over Dronning Maud Land. There are significant differences between the various satellite measurements. Stratospheric temperatures are past their coldest, and a warming is taking place. All parts of the ozone layer are now above the threshold for Polar Stratospheric Cloud formation, though such clouds can still persist. Through most of the ozone layer they are now near to above the long term average. The polar vortex was a little above average in size at its peak in mid August but is now shrinking and is a little smaller than the mean for the time of year over the last decade. The 2014 Ozone Hole: The ozone hole began to form in early August and grew rapidly from mid month, covering some 23 million square kilometres at its peak in mid September. By late October the size had declined to around 14 million square kilometres. During August and September it was generally similar in size to the ozone hole of 2013, and mostly smaller than the decadal mean. During October it has been around the decadal mean and larger than the holes of 2012 or 2013. Daily values at Rothera dropped below the ozone hole threshold of 220 DU for the first time on July 17 and did so again on August 6 and 7. 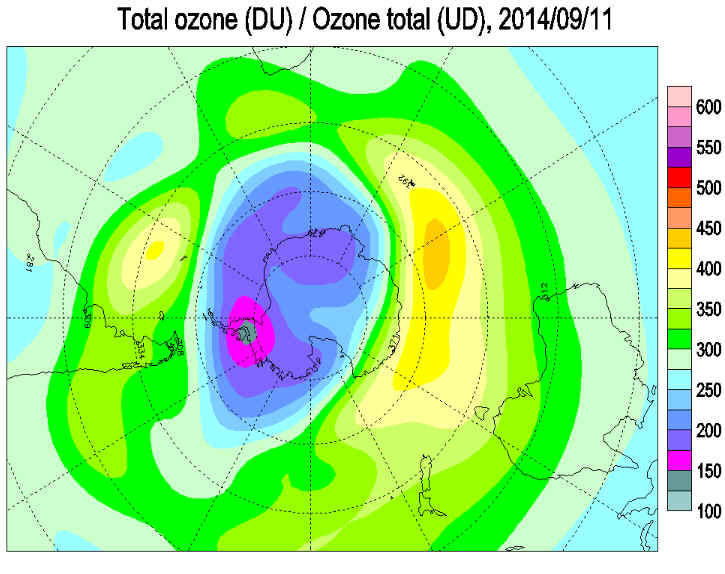 The station was within the ozone hole from August 18 to 26, and from September 6 to October 14. Ozone values at Vernadsky first dropped below the threshold on August 14 and it was within the ozone hole from August 18 to 26 and from September 8 to October 12. These edge region stations move from within the ozone hole to outside it as the polar vortex rotates. Halley has been within the ozone hole since measurements began at the end of August but ozone values are beginning to increase. The edge of the ozone hole covered the southern tip of South America from September 13 to 18, the southern tip of South America, the Falkland Islands and South Georgia from October 7 to 15 and South Georgia on August 25 to 27, October 3, 4, . It is likely to do so again around November 1 to 2. Antarctic ozone today: The ozone hole is past its deepest and largest and is slowly beginning to fill. The ozone distribution is that of spring with ozone amounts highest around the Southern Ocean and amounts lowest over the continent. Highest ozone values, above 430 DU, are over the Southern Ocean in a broad swathe south of New Zealand to Australia, with lowest values, around 150 DU, over Dronning Maud Land. There are significant differences between the various satellite measurements. Stratospheric temperatures are past their coldest, and a warming is taking place. A few areas in the lower part of the ozone layer remain below the threshold for Polar Stratospheric Cloud formation. Through most of the ozone layer they are now near to above the long term average. The polar vortex was a little above average in size at its peak in mid August but is now shrinking quickly and smaller than the mean for the time of year over the last decade. The 2014 Ozone Hole: The ozone hole began to form in early August and grew rapidly from mid month, covering some 23 million square kilometres at its peak in mid September. By mid October it had declined to around 13 million square kilometres. It has generally been similar in size to the ozone hole of 2013, and mostly smaller than the decadal mean. Daily values at Rothera dropped below the ozone hole threshold of 220 DU for the first time on July 17 and did so again on August 6 and 7. The station was within the ozone hole from August 18 to 26, and from September 6 to October 14. Ozone values at Vernadsky first dropped below the threshold on August 14 and it was within the ozone hole from August 18 to 26 and from September 8 to October 12. These edge region stations move from within the ozone hole to outside it as the polar vortex rotates. Halley has been within the ozone hole since measurements began at the end of August but ozone values are beginning to increase. 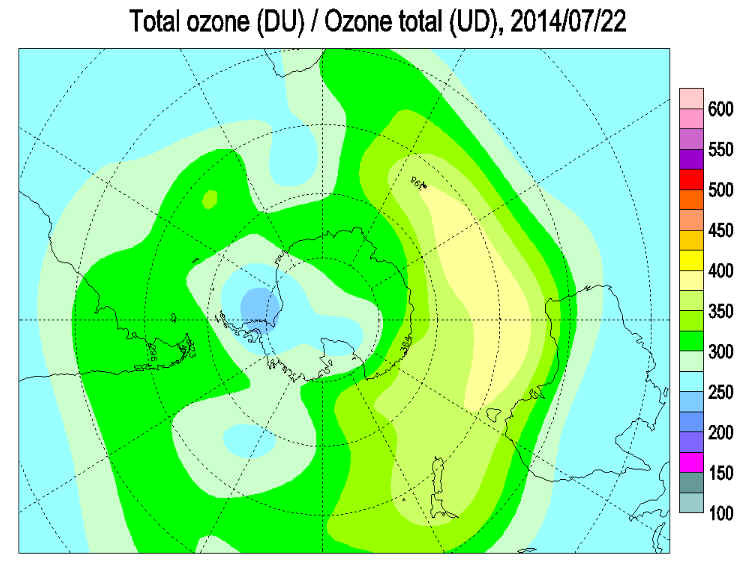 Antarctic ozone today: The ozone hole is past its deepest and largest and is beginning to fill. The ozone distribution is that of spring with ozone amounts highest around the Southern Ocean and amounts lowest over the continent. Highest ozone values, above 430 DU, are over the Southern Ocean in a broad swathe south of Australia to South America, with lowest values, around 150 DU, over Dronning Maud Land. There are significant differences between the various satellite measurements. Stratospheric temperatures are past their coldest, and a warming is taking place. A few areas remain below the threshold for Polar Stratospheric Cloud formation. Through most of the ozone layer they are now near to above the long term average. The polar vortex was a little above average in size at its peak but but is now shrinking and smaller than the mean for the time of year over the last decade. The 2014 Ozone Hole: The ozone hole began to form in early August and grew rapidly from mid month, covering some 23 million square kilometres at its peak in mid September. By mid October it had declined to around 15 million square kilometres. It has generally been similar in size to the ozone hole of 2013, and mostly smaller than the decadal mean. Daily values at Rothera dropped below the ozone hole threshold of 220 DU for the first time on July 17 and did so again on August 6 and 7. 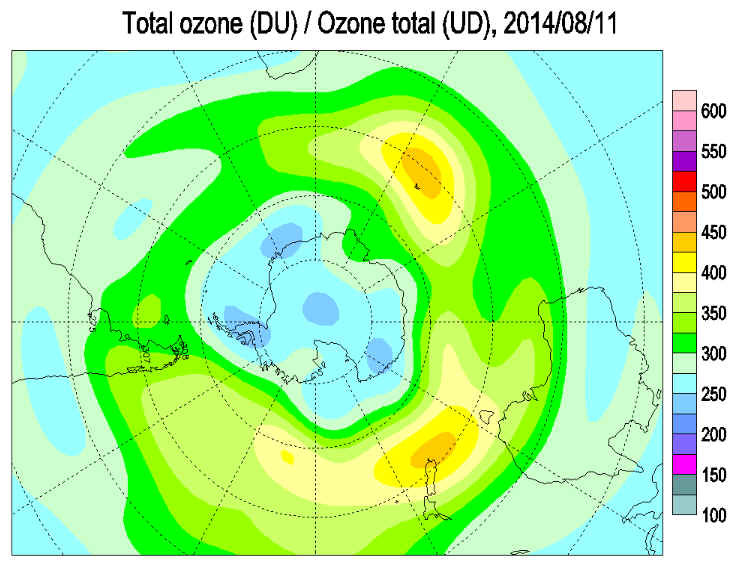 The station was within the ozone hole from August 18 to 26, and from September 6 to October 14. Ozone values at Vernadsky first dropped below the threshold on August 14 and it was within the ozone hole from August 18 to 26 and from September 8 to October 12. These edge region stations move from within the ozone hole to outside it as the polar vortex rotates. Halley has been within the ozone hole since measurements began at the end of August but ozone values are beginning to increase. 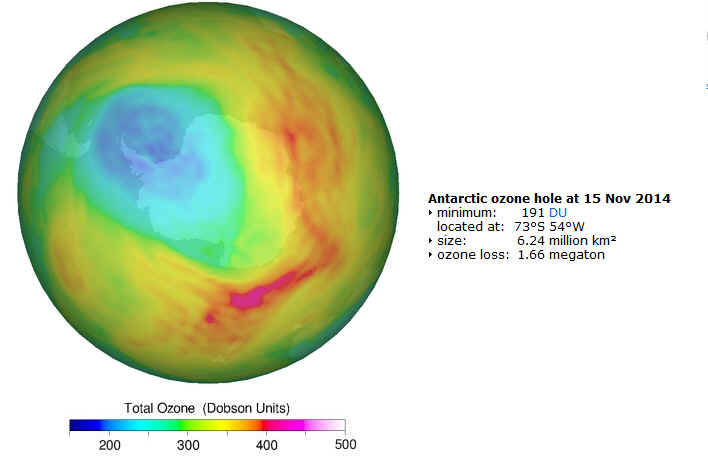 Antarctic ozone today: The ozone hole is probably past its deepest and largest. The ozone distribution is that of spring with ozone amounts highest around the Southern Ocean and amounts still near their minimum over the continent. Highest ozone values, above 450 DU, are over the Southern Ocean in a broad swathe south of Australia, with lowest values, below 150 DU, over Dronning Maud Land. There are significant differences between the various satellite measurements. Stratospheric temperatures are past their coldest, and a warming is taking place. Some areas remain below the threshold for Polar Stratospheric Cloud formation. Through most of the ozone layer they are now near the long term average. The polar vortex has been a little above average in size for the time of year over the last decade but has passed its largest. The 2014 Ozone Hole: The ozone hole began to form in early August and grew rapidly from mid month, covering some 23 million square kilometres at its peak in mid September. By early October it had declined to around 19 million square kilometres. It has generally been similar in size to the ozone hole of 2013, and mostly smaller than the decadal mean. Daily values at Rothera dropped below the ozone hole threshold of 220 DU for the first time on July 17 and did so again on August 6 and 7. The station was within the ozone hole from August 18 to 26, and has been since September 6. Ozone values at Vernadsky first dropped below the threshold on August 14 and it was within the ozone hole from August 18 to 26 and since September 8. These edge region stations move from within the ozone hole to outside it as the polar vortex rotates. Halley has been within the ozone hole since measurements began at the end of August and ozone values are near their minimum. Antarctic ozone today: The ozone distribution is that of spring with ozone amounts highest around the Southern Ocean and amounts near their minimum over the continent. Highest ozone values, above 450 DU, are over the Southern Ocean in a broad swathe south of Australia, with lowest values, below 150 DU, over West Antarctica and Coats Land. There are significant differences between the various satellite measurements. Stratospheric temperatures are past their coldest, and a slow warming is taking place. Some areas remain below the threshold for Polar Stratospheric Cloud formation. Through most of the ozone layer they are now near the long term average. The polar vortex has been a little above average in size for the time of year over the last decade and is near its largest. The 2014 Ozone Hole is near its deepest and largest. The ozone hole grew very rapidly in area in early September, soon covering some 20 million square kilometres, and remained near this size in late September. It has generally been similar in size to the ozone holes of 2012 and 2013, and smaller than the decadal mean. Daily values at Rothera dropped below the ozone hole threshold of 220 DU for the first time on July 17 and did so again on August 6 and 7. The station was within the ozone hole from August 18 to 26, and has been since September 6. Ozone values at Vernadsky first dropped below the threshold on August 14 and it was within the ozone hole from August 18 to 26 and since September 8. These edge region stations move from within the ozone hole to outside it as the polar vortex rotates. Halley has been within the ozone hole since measurements began at the end of August and ozone values are near their minimum. Antarctic ozone today: The ozone distribution is that of early spring with ozone amounts highest around the Southern Ocean and amounts rapidly declining over the continent as ozone depletion takes hold. Highest ozone values, above 450 DU, are over the Southern Ocean south of the Indian Ocean, with lowest values, below 150 DU, over the Weddell Sea and Palmer Land. There are significant differences between the various satellite measurements. Stratospheric temperatures are past their coldest, and are widely below the threshold for Polar Stratospheric Cloud formation. A warming is beginning to take place in the highest part of the ozone layer. Through most of the ozone layer they are colder than the long term average. The polar vortex is a little above average in size for the time of year over the last decade and at its largest. The ozone hole itself has grown very rapidly in area since the beginning of September and covered some 18 million square kilometres in mid September; it has generally been similar in size to those of 2012 or 2013, and smaller than the decadal mean. Antarctic ozone today: The ozone distribution is that of early spring with ozone amounts highest around the Southern Ocean and amounts declining over the continent as ozone depletion takes hold. Highest ozone values, above 400 DU, are over the Southern Ocean south of Australia, with lowest values, below 170 DU, over West Antarctica. There are significant differences between the various satellite measurements. Stratospheric temperatures are past their coldest, and are widely below the threshold for Polar Stratospheric Cloud formation. Through most of the ozone layer they are colder than the long term average. The polar vortex is about average in size for the time of year over the last decade and nearing its largest. The ozone hole itself has grown rapidly in area since early August and now covers some 15 million square kilometres; it has generally been a little larger than in 2012 or 2013 . The 2014 Ozone Hole is deepening. Daily values at Rothera dropped below the ozone hole threshold of 220 DU for the first time on July 17 and did so again on August 6 and 7. The station was within the ozone hole from August 18 to 26, and has been since September 6. Ozone values at Vernadsky first dropped below the threshold on August 14 and it was within the ozone hole from August 18 to 26. The ozone hole then rotated away from these edge region stations. Halley has been within the ozone hole since measurements began at the end of August. Antarctic ozone today: The ozone distribution is that of late winter with ozone amounts increasing around the Southern Ocean and amounts declining over the continent as ozone depletion takes hold. Highest ozone values are near 450 DU over parts of the Southern Ocean, with lowest values below 170 DU near Dronning Maud Land. There are significant differences between the various satellite measurements. Stratospheric temperatures are nearing their coldest, and are widely below the threshold for Polar Stratospheric Cloud formation. The polar vortex is about average in size for the time of year over the last decade and nearing its largest. The ozone hole itself has grown rapidly in area since early August and now covers some 16 million square kilometres, larger than the average over the last decade and much larger than in 2012 or 2013 . The 2014 Ozone Hole has begun to form. Daily values at Rothera dropped below the ozone hole threshold of 220 DU for the first time on July 17 and did so again on August 6 and 7. The station was within the ozone hole from August 18 to 26. Ozone values at Vernadsky first dropped below the threshold on August 14 and it was within the ozone hole from August 18 to 26. Antarctic ozone today: The ozone distribution is that of late winter with ozone amounts increasing around the Southern Ocean and amounts declining over the continent as ozone depletion takes hold. Highest ozone values are above 450 DU over the Southern Ocean south of New Zealand, with lowest values below 230 DU near Dronning Maud Land. There are significant differences between the various satellite measurements. Stratospheric temperatures are nearing their coldest, and are widely below the threshold for Polar Stratospheric Cloud formation. The polar vortex is about average in size for the time of year over the last decade. Forecasts suggest that the ozone hole will hit the threshold for formation around August 12, and will grow rapidly in area thereafter. The 2014 Ozone Hole has begun to form and daily values at Rothera dropped below the ozone hole threshold of 220 DU for the first time on July 17 and did so again on August 6 and 7, those at Vernadsky approached close to the threshold on July 26 and August 6. Antarctic ozone today: The ozone distribution is that of winter with ozone amounts increasing around the Southern Ocean and lower amounts over the continent. Highest ozone values are above 400 DU over the Southern Ocean south of Australia, with lowest values below 230 DU over Palmer Land to West Antarctica, and over Dome F. There are significant differences between the various satellite measurements. Stratospheric temperatures are still cooling, and are widely below the threshold for Polar Stratospheric Cloud formation. The 2014 Ozone Hole has begun to form and daily values at Rothera dropped below the ozone hole threshold for the first time on July 17. Antarctic Situation -Antarctic ozone today: The ozone distribution is that of winter with ozone amounts increasing around the Southern Ocean and lower amounts over the continent. Highest ozone values are around 400 DU over the Southern Ocean south of Australia, with lowest values below 240 DU over the centre of the continent. There are significant differences between the various satellite measurements. Stratospheric temperatures are still cooling, and are widely below the threshold for Polar Stratospheric Cloud formation. The 2014 Ozone Hole has not yet begun to form.